The little village of Velddrif is situated about two kilometres inland from the mouth of the Berg River. First discovered by the Portuguese seafarer Vasco da Gama in 1497 when he entered St Helena Bay looking for water the area has been part of maritime history ever since. In 1693 a Dutch ship Die Gouden Buys ran aground about eight miles south of the river mouth after most of her crew of 200 men had died of scurvy and related diseases while on the voyage from Holland to the Cape. Seven starving men managed to come ashore and made their way north to the Berg River where they drank salt water from the river not knowing that the river was tidal and at low tide the water would be fresh. Of these seven men only two survived after being rescued by the Hottentot clans that lived along the river banks. After being notified that a ship had run aground on the coast the Dutch authorities at the Cape sent ships to the area to rescue the seamen and salvage the cargo on board. Over the next few years people from the Cape started visiting the area and found that St Helena bay was a fisherman's paradise. Word got out and one of the first Europeans to arrive and settle at Laaiplek at the mouth of the Berg river was Carl Stephan. He was a fish merchant and soon he and his brothers had a flourishing shipping, fishing and farming enterprise going. Laaiplek (loading place) became the harbour and although it had a large sand bank across its mouth it still allowed ships to enter the river which was navigable for a number of kilometres upstream. The village of Velddrif was established about two kilometres further upstream and gets its name from a river crossing in the area. A farmer by the name of Theunis Smit used the crossing to take his livestock across the river and hence the name" Field Crossing " or Velddrif as it is known today. The town was formally recognised in 1946 and eventually became a Municipality in 1960. In the early years of the Cape many towns were established around a Dutch Reformed church but in the case of Velddrif the town was established around a fish cannery. The town being on the northern side of the river meant that its people were cut off from the Cape so in 1899 a pont was built to ferry people and their livestock across the river. It stayed in service until 1950. Eventually in 1959 the Carinus Bridge was completed and gave permanent access to the Cape to the people of Velddrif. The towns of Laaiplek and Velddrif began to flourish. In 1968 the Cape authorities blew a channel through the massive sandbank at the mouth of the river and this allowed the harbour at Laaiplek to be completed. Today the towns of Laaiplek and Velddrif are about a 90 minute drive up the R27 highway from Cape Town. 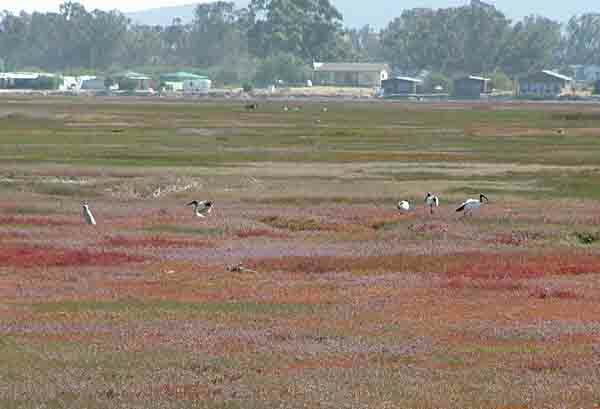 On crossing the bridge into the town you are welcomed by flocks of flamingoes wading in the marshes and pelicans flying overhead in search of food in the estuary of the Berg River. The marshes contain many different species of water birds which include Blue Heron, Redshank, thousands of Curlew Sandpipers and Plovers. Other wild life such as Otters and Water Mongoose can also be seen on the marshes. Over the years industry has flourished with factories for fish canning and the making of fish meal products being the chief industries. Along the river are a number of salt pans where salt is collected by a locally established company. One of the oldest industries in the area is no doubt the drying of fish which is done on the banks of the Berg River. Large sardines or haarders as they are called are caught in the bay or river mouth and are salted and hung out to dry. Once dry the Bokkoms as they are known are sold to fish biltong lovers. Other than the fishing industry the area has over the years developed a tourist industry which concentrates on the river. Port Owen is a marina development of 100 ha with 3 1/2 km of private waterways meandering through it. It has over 700 freehold plots as well as sectional title flats and some timeshare units. 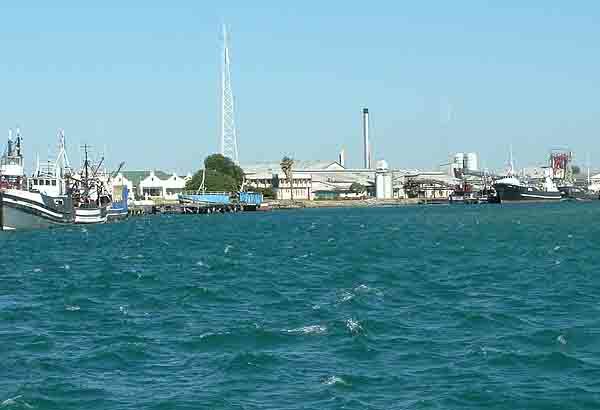 The developers were put under curatorship and eventually wound up but Port Owen has long been in the hands of individual owners. It has shown outstanding growth in property values and is the country's first and still best deep-sea residential marina, and having St. Helena Bay as its home water's offers yachtsmen, powerboaters and fishermen conditions second to none. Every year Velddrif is inundated with people when the Berg River Canoe marathon is staged. This marathon starts near Paarl and makes its way downstream finishing near the mouth of the Berg River. 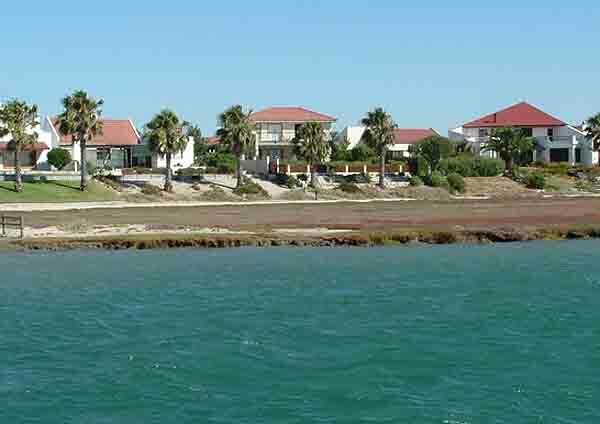 For those who are just looking for a beach holiday with safe swimming the beaches in and around Velddrif are pristine and safe. Just one word of warning however, the water along the west coast is cold and not for the feint hearted. In early Spring the west coast is at its most beautiful when the dry fields along the R27 and the Berg river transform themselves into fields of colour as the wild flowers come into bloom. With so much more to offer visitors these days than a hundred years ago the west coast is becoming a very popular destination. Locals from all over South Africa are streaming to the area to purchase beachfront properties along the pristine Atlantic coastline. In the past fresh water was a problem but these days it is pumped out of the Berg River to supply the burgeoning new developments along the coastline. Overseas visitors also arrive in their droves to see the wild flowers in Spring and to enjoy the seafood restaurants found in most towns along the west coast.